The Western Pacific Regional Fishery Management Council (WPRFMC) acknowledges that the President’s amended Pacific Remote Islands Marine National Monument (PRIMNM) expansion plan reduces the economic toll the original plan would have taken on sustainable US Pacific Island fisheries. The announcement of the final plan comes after months of the WPRFMC expressing serious concern for a sudden, unilateral proposal from the White House to expand the monument. The WPRFMC has been informed by the White House by phone today that the monument will now extend to 200 miles around Johnston Atoll, Jarvis Island and Wake Island, but the existing 50-mile PRIMNM boundary will remain around Howland and Baker Islands and Palmyra Atoll and Kingman Reef. HONOLULU (WPRFMC) – September 24, 2014 – A plan announced in June to vastly expand the Pacific Remote Islands Marine National Monument (PRIMNM) – and in turn prohibit commercial fishing therein – has been amended to better accommodate economically vital fishing industries for Hawaii and the U.S. Pacific Islands. Following a West Wing meeting joining representatives of the Western Pacific Regional Fishery Management Council (WPRFMC) and the Hawaii longline fishing industry with Counselor to the President John Podesta and White House Council on Environmental Quality Acting Chair Mike Boots, and in the wake of public criticism and media attention, the White House announced today a revised plan for the President’s expansion of the PRIMNM. In the months since the June 17 announcement to expand the size of the PRIMNM tenfold, the WPRFMC; the governors of American Samoa, Guam and the Commonwealth of the Northern Mariana Islands (CNMI); the American Samoa and CNMI legislatures; US longline and purse-seine fishermen; tuna cannery representatives; and marine science experts have expressed deep concerns regarding the shortcomings of the proposed expansion. According to those speaking out in opposition, the initial plan for expansion disregarded essential local fishing industries and provided negligible gains for conservation. The revised plan will expand the monument to include the 200-mile Exclusive Economic Zones (EEZ) surrounding Johnston Atoll, Jarvis Island and Wake Island, but will not expand the existing 50-mile prohibitions on fishing around Howland and Baker Islands and Palmyra Atoll and Kingman Reef. The WPRFMC expresses appreciation to President Obama for considering the economic and cultural concerns of American citizens, particularly in Hawaii and American Samoa, who will be most affected by the expansion. 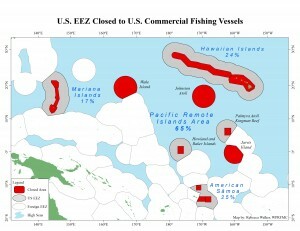 According to the WPRFMC, these revisions will allow U.S. fishermen to continue their operations within traditional fishing grounds under existing regulations in 35 percent of the US EEZ around the US Pacific Remote Islands, but will remove them completely in 65 percent of the US EEZ around these islands. “Our US Pacific Island fishermen already comply with the strictest regulations in the world,” said Kitty Simonds, WPRFMC executive director. She added, “We appreciate the White House’s compromise on a monument expansion that could have devastated the region’s fisheries and communities without notable environmental benefits. We now look to see how this declaration will be achieved in practice, beyond paper and politics, and hope that the US Coast Guard will use additional enforcement funds to patrol US waters as a first priority. Still, fishing industry representatives have spoken publicly of their concerns for the lack of an environmental and public review process, proper representation and transparency in the decision-making affecting monument expansion. Simonds said that the WPRFMC anticipates working with the National Marine Fisheries Service to develop, under the Magnuson-Stevens Fishery Conservation and Management Act, the revised fishing regulations for the expanded monument, as it has for the other marine national monuments.